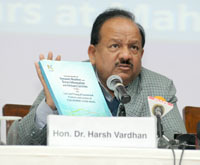 The Union Minister for Science & Technology and Earth Sciences Dr Harsh Vardhan has mooted the idea of further strengthening services of the Ministry of Earth Sciences for providing weather and climate forecast to farmers and fishermen. Addressing a Press Conference in New Delhi today he said we all have seen significant change in quality of forecasts and the Ministry of Earth Sciences has been asked to strengthen dissemination of such data to users in the field. The Minister noted that the Gramin Krishi Mausam Seva has been successful in providing crop specific advisories to farmers at the district level twice a week. The Potential Fishing Zone Advisory Service has also been operationalized to benefit the coastal fishermen community. The Minister of State for Science & Technology and Earth Sciences Shri Y.S Chowdary said is proposed to increasingly involve network of NGOs through State Governments to disseminate information to farmers. He said electronic media in regional languages, besides the recently launched Kisan Channel should also increasingly help in reaching such information to peasants. The task of carrying out a comprehensive third party assessment of socio-economic benefits of these services was entrusted to the reputed National Council of Applied Economic Research (NCAER), Delhi and in its report the Council pointed out that the farming community of the country is using such Agro-Meteorological Advisory Service products for critical actions during their farm operations viz. • Managing (curtailing) artificial irrigation in case of Heavy Rainfall Forecast. The Secretary Ministry of Earth Sciences Dr. M Rajeevan gave a presentation on the findings of the report. Concurrently, with the implementation of District Level Agro-meteorological Advisory Services, India has seen improved agriculture performance in the rain-fed farming, which in turn covers 60% of the total arable land. More importantly, the study found that 95% of the farmers (surveyed) have been experiencing an improved reliability of the service in recent years. The incremental profit due to Agro-Meteorological Advisory Services is assessed to be 25% of their net income. Further, the Annual Economic Profit of 24% of the community, cultivating 4-principal crops (wheat; Paddy; Sugarcane; Cotton), after using the Agro-Meteorological Advisory Service in 2010, was assessed at Rs. 38,463crs and for the same base this has raised to Rs. 42,000crs in 2015. The study also suggests that the Gramin Krishi Mausam Seva has the potential of generating net economic benefit up to Rs. 3.3 lakh crores on the 4-principal crops alone when Agro-Meteorological Advisory Service is fully utilized by 90.3million agriculture-dependent households. The Union Minister noted that recent efforts like the KISAN Portal, state level service partnerships etc., to enhance the penetration of SMS dissemination, has led to increase in the subscriber base to 11.50million farmers from 2 million farmers in 2010. The Ministry is intending to rope in all available agencies including NGOs operating at sub-district level, by organizing district level awareness and training programs at Krishi Vigyan Kendras. It would lead to the maximization of the outreach of the Agro-Meteorological Advisory Service and increase the SMS dissemination to cover all farming families in coming years. The annual value addition since Potential Fishing Zone Advisory Services are being extended to one million coastal fishermen community is assessed to be Rs. 4700 crores. The GDP contribution of Potential Fishing Zone and Ocean State Forecasting services for the fisheries sector has been assessed at 3.9% in 2012-13 from 1.9% in 1995-96 and can potentially increase to 7.8%. Accordingly, the additional income to fishermen is aggregated at Rs. 3,034crores annually. On account of increase in per unit catch due to targeted potential fishing zone identification, aggregate annual benefit is expected to be RS. 36,200crores. In addition to this there are environmental benefits as saving in overall diesel consumption which, in turn, is computed as carbon credits. Additional cumulative economic benefits are also realized from Ocean State Forecasting services by Indian Navy, Coast Guard, and value-addition for oil & gas exploration platforms (not quantified in the study). Delving into the future potentiality of this initiative, Dr. Harsh Vardhan said that the Ministry is intending to cover all minor and medium fishing harbours in 72 coastal districts in various States and Union Territories by organizing district level workshops/awareness programs. The Ministry of Earth Sciences has been asked to prepare detailed action plans, to accomplish these targets by 2019, the minister pointed out.